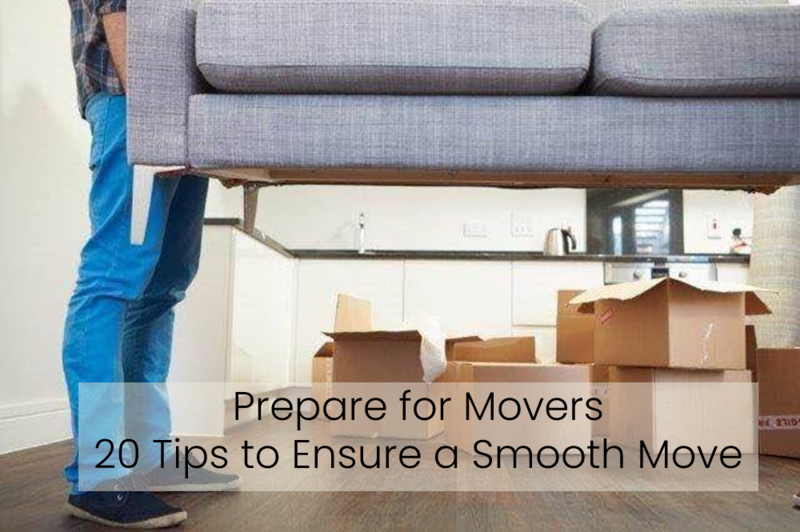 Every step you take to prepare for movers before they arrive will save you time, frustration, and stress on moving day. The first time we moved with professional movers was a week and a half before Christmas. I had a 2 month old baby and a 2-year-old and my husband was out of town when the movers arrived. I didn't have any idea what to expect or what I needed to do to prepare for movers. Needless-to-say, it wasn't the smoothest of moves. It was, in fact, extremely frustrating and overwhelming. My tenuous plan quickly unraveled, and we ended up spending Christmas in our new location with an air mattress, a borrowed lawn chair, and a fake Christmas tree, eating off of paper plates while our stuff sat in storage. Since then, I've had lots of practice dealing with professionals and learned plenty of tricks to help prepare for movers so that everything goes smoothly from start to finish. I hope you will find these tips useful as well as you prepare for movers. ​so take the time to prepare for movers in advance. At a minimum, a responsible adult must be present at all times. Ideally, that adult should be you or your spouse. This isn't something you want to leave to others to deal with if you can avoid it. In the unlikely event that you can not be present make sure the person you designate to take your place is someone you trust with everything you own. If possible arrange for your children to play at the home of a relative or friend on the days when you have packers and/or movers. If this is not possible, plan activities in advance to keep kids entertained so that you can concentrate on the movers. If children are going to be present during the packing and loading of your shipment, it's a good idea to keep the kids and the movers separate. Designate a place for the kids to hang out. Empty this space of anything you want the movers to pack/load. This can be a big task, but it's well worth the effort if you don't have somewhere for your kids to go on moving day. Having a room to themselves where they can spread out and play will keep kids happier much longer than if they are constantly being told to move out of the way. Pets should be kept out of the movers’ way as well. Place them in a kennel or cage, keep them in a fenced area or send them away for the day. Choose a room or portion of a room which can be cordoned off and place all the stuff that is traveling with you in that space. Clearly mark the space DO NOT PACK and let the movers know that you plan to take these items with you. Remember to include things like cleaning supplies in this pile since you will need them to clean the house once it’s empty. Also stash any items that will be staying with the house in this space. This might include instruction manuals and warranties for appliances, various hardware items, keys, and so forth. If you’re kids are hanging around include things to keep them entertained and make sure they understand that anything they remove from that space must be put back or it will get packed. Hold a family council to discuss what to expect when the movers arrive, what role each individual will play (if any), and what the expectations are for behavior. Moving can be traumatic for children (and adults!). Help them to prepare for movers by keeping them informed. Explain things at their level in order to help them cope with the disruption that moving creates. This will also help to prevent them from becoming a disruption. A household inventory is just like it sounds; it’s an inventory of all your stuff. Household inventories are useful when filing insurance claims but they have the added benefit of serving as proof of the contents of your household shipment should something go missing or get damaged. Even if you don’t have time to prepare a full-blown household inventory take the time to jot down serial numbers. Locating and recording serial numbers on all of your electronics and appliances is a useful practice to prepare for movers. Serial numbers should be listed, along with the brand and type of item on the inventory the movers prepare. They should also be listed on the boxes in which the items are packed. For more information on preparing a household inventory, click on the image below. This tip is particularly important if you have an older home or over-sized furniture. I once had movers who could not get my 1990’s sofa through my 1820’s doorway. They were just going to leave the sofa! That wasn't really an option in my mind since we were moving cross country in a minivan with three small children and had no way of transporting it ourselves. I was pregnant, I had bronchitis, it was 20°F outside (with the doors open all day), and my husband was (once again) out of town. Perhaps these facts are irrelevant, but they certainly felt pertinent at the time! After a great deal of arguing, some fervent (albeit silent) praying, several phone calls, and a fit of inspiration, I showed them how to do it, but that little obstacle cost us a huge chunk of time. Those movers were at my house until well after 9 pm. If you found this information useful, you're sure to love Moving Made Easy: A Step-by-Step Guide to a Successful Move. It contains all the moving information available here on the website plus tons of additional information on topics like preparing your family for a move, budgeting for a move, and moving with pets. Also included are 10 printable checklists to help you organize every aspect of your move. Get your copy today! This may not be required, but I like to do it when I prepare for movers. It makes things go smoother on move day. It also makes unpacking and arranging my new home easier after the movers have gone. I like to have all my photographs and artwork in one location where I can ‘shop’ for the perfect piece to go in a specific location as I am unpacking and arranging things. Place artwork in neat stacks against a wall and stack photographs on a coffee table or other flat surface where movers can easily access them. They prefer to pack such items together and will go in search of them when they are ready to pack them if you haven’t already grouped them together. I’m talking here about the really small stuff like paper clips and other office supplies. On our first move with professional movers, I left everything as it was in the desk drawer for the movers to deal with. They just pulled the desk organizer out, wrapped it in paper with the contents still inside it, and stuffed it sideways in a box. When I opened the box, there were dozens of loose paper clips and other tiny doodads littered throughout. Now as I prepare for movers, I place the contents of my desk drawer in a shoe box-sized plastic container. I put the really small stuff like paper clips in a snack size baggie before placing them in the box. The only thing the movers have to pack is the plastic shoe box, and I don't have a mess to deal with on the other end. Much better. Look around your house for small items which may benefit from a little pre-packing. Use baggies and/or plastic boxes to corral them and keep them neat for moving day. Then, if appropriate, group them into plastic storage containers for easy packing on moving day. Remove all bedding before the movers arrive so that the beds are ready to be disassembled and packed up. For more tips and information on working with movers, click on the image below. Remove garbage from your house in the morning and stash a trash bag in your no-pack zone for collecting trash throughout the day. If you need to keep the trash bag more accessible, write TRASH – DO NOT PACK on it just to be safe. Prepare for movers the day before their arrival by cleaning out any trash cans that are moving with you to avoid foul odors in your shipment and keep things clean and sanitary. As your movers disassemble beds and other furniture, use the baggies to collect all the associated hardware. Use the marker to label each baggie. Then place all your hardware in a plastic shoe box and carry it with you to your new location. If you are flying and don't want to pack a bulky box of hardware, put it in one of your boxes and label the box clearly so you can find it easily when you need it. It’s frustrating to get to the end of a long day and find that you have to go to the store because the hardware for the baby's crib somehow failed to arrive with the rest of your shipment. Yes, I am speaking from experience. It is tempting to start packing as you prepare for movers. In my experience, and to the best of my knowledge, most movers will not accept liability for boxes you have packed yourself, so leave the packing to them. The one exception to this rule is original packaging which is custom fitted for the specific item it contains. If you are hoping to do some of your own packing to cut costs and save time, check with your movers first to see what their policy is regarding items you pack yourself. For years we used to save the original packaging on just about everything. We had piles and piles of empty boxes. Finally, I realized it really wasn't necessary. Movers are terribly fond of packing paper, and they go to great lengths to pad and protect things, particularly electronics. There are a handful of items for which we still keep the original packaging - items with multiple parts that come in boxes with Styrofoam fittings to cushion and protect each piece - but I've tossed out most of them. It just doesn't make sense to keep them. They take up a ton of space, and they tend to get battered over time. 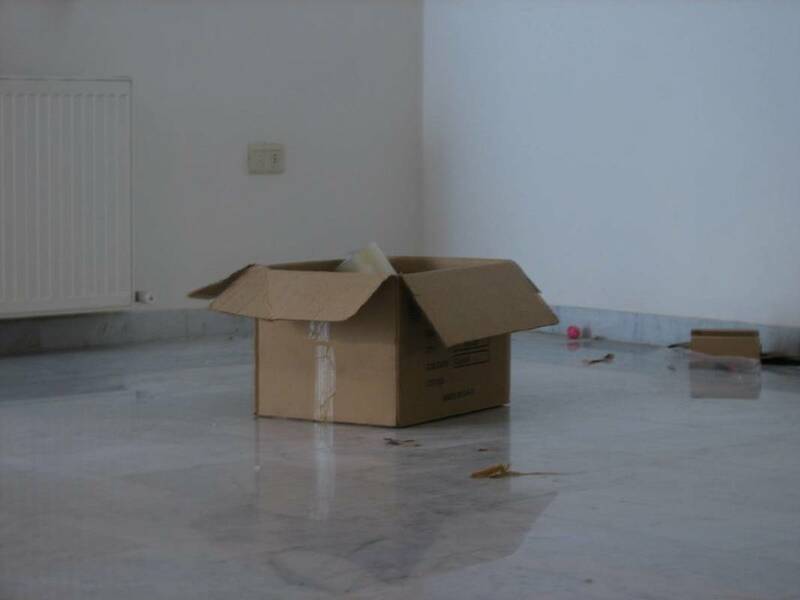 Movers will usually disassemble and reassemble any items that require it. That said, you may find that you prefer to take care of certain items yourself in advance as you prepare for movers. It has been our experience that some items confuse the movers causing them to waste a lot of time on their assembly or disassembly. At times, they have even put things together incorrectly. For this reason, we sometimes find that it’s just easier to do certain items ourselves. This is particularly true of custom pieces. If you don’t want to do the manual labor yourself, but you’re concerned about their ability to properly take apart and put together your furniture, just make sure you’re on hand to answer questions. As always, it's important to check with the movers regarding their policy. Moving is messy. Brace yourself for the fact that you’re empty home is going to be a dusty, dirty disaster area when the movers are done with it. The constant tracking in of dirt from outside mingled with the unveiling of dust bunnies previously hidden beneath the furniture combine to create an asthmatic nightmare. If you, or anyone in your family, are allergic to dust be forewarned that there may be a lot of it on moving day. Take any necessary precautions to prevent an asthma or allergy attack as you prepare for movers. The advice featured here is the result of personal experience, research, and observation and should not take precedence over information provided to you by the moving company with which you are working. Contact your carrier regarding any questions you may have and be sure to read carefully any materials they provide. If you found this page helpful, please share it on social media. While you're here, please leave me a comment in the section below as well. I would love to hear from you.